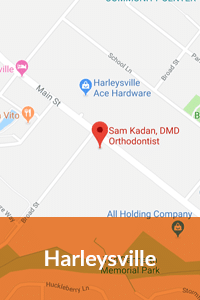 Only one in three orthodontists is board certified, so working with Sam Kadan DMD orthodontist and his great team gives you access to the highest quality of care and expertise you need for your orthodontic needs with the latest trends in braces and Invisalign. 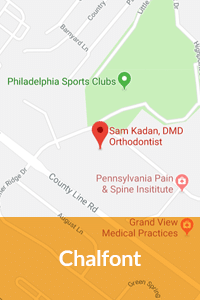 Dr. Kadan offers four convenient locations for patients in the Bucks County area. • Doylestown Location - conveniently located a few minutes’ drive away from Forest Grove, Fountainville, Furlong, Gardenville, Lahaska, Lambertville, NJ, Mechanicsville, New Hope, Pineville, Plumsteadville, and Solebury. 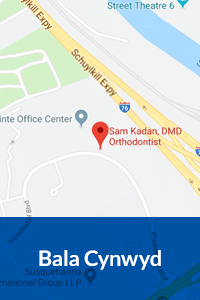 • Bala Cynwyd Location – serving patients in Ardmore, Germantown, Gladwyne, Haverford, Lansdowne, Melrose Park, Merion Station, Millbourne, Narberth, and Philadelphia. 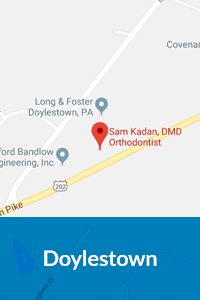 • Chalfont Location – attends to the needs of orthodontic patient in North Wales, Montgomeryville, Lansdale, Sellersville, Perkasie, New Britain, Hatfield, Sellersville, and Warrington. • Harleysville Location – serving patients in Earlington, Graterford, Lederach, Perkiomenville, Rahns, Salfordville, Schwenksville, Souderton, Sumneytown, and Woxall.